What an amazing choice of wedding venue Kew Gardens is – not only the location, just outside London in Richmond, and the gardens – beautiful at any time of year, but also the buildings – such variety, and all providing me with so many amazing backdrops I was totally spoilt for choice. Kew Gardens wedding photography really is a treat. We had the gardens to ourselves from late afternoon onwards – and a golf buggy to ferry the bride and groom (and their photographer obviously!) to and from locations. Karen and bridal party got ready at The Petersham Hotel with amazing views over the River Thames. 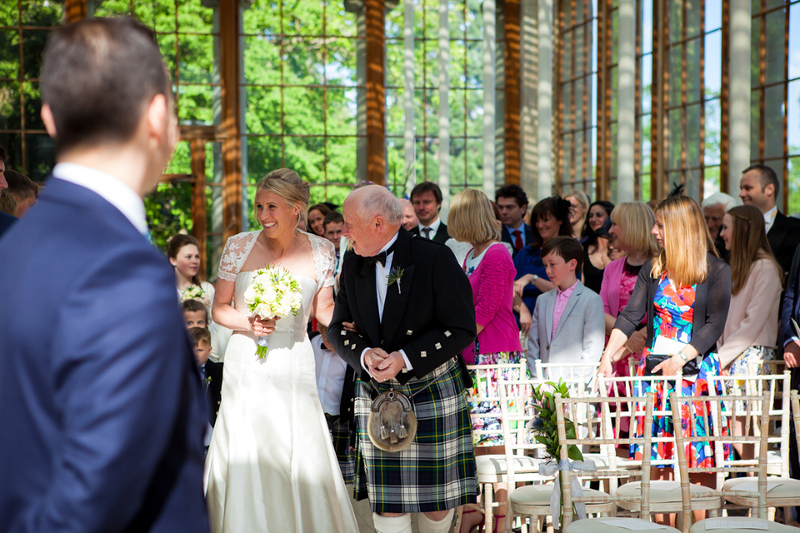 The wedding itself was in the beautifully light and airy Nash Conservatory. This was followed by drinks in the more modern Princess of Wales Conservatory – at the time of the wedding there was a stunning orchid display (as if we didn’t have enough backdrops to choose from!). Then dinner, speeches (I cried!) and some spectacular dancing in the Orangery. To add to it all, was the chance to get to know Karen and Jim – both such lovely, warm people, with similarly gorgeous family and friends. I was genuinely sad when I handed them their album that the process was over! Thanks to Nav for being an amazing second shooter as ever!